Ryan Lepic (University of Chicago) and Corrine Occhino (RIT) will teach the Gesture and Sign Language Analysis course at the Institute at Davis. Their course is set to highlight the Institute theme, “Linguistics in the Digital Era”, by incorporating digital methods in multimodal language analysis. Continue reading to learn more about Ryan’s past and current research, among many other interesting facts. Can you tell us about your linguistic background? I grew up in Iowa, in a monolingual English-speaking family. I was a big reader as a kid, and was enchanted by the idea of language “rules”, particularly how skilled authors subvert or break the “rules” for stylistic effect. In high school, I took German as a foreign language, and I loved discovering the many points of similarity and difference between English and German as historically related languages. So, as an undergrad in the English Department at Arizona State University, I mostly took classes having to do with language use, the history of the English language, and comparison across languages. Fortunately, this turned out to be good preparation for the graduate program in the Linguistics Department at UC San Diego. While I was in San Diego, I was lucky to make several deaf friends and to learn American Sign Language, the language I now work with the most. In short, I have always been interested in how people use language to accomplish particular goals, and how languages drift and change over time, as a result of how people use them. I first joined the LSA in 2013, when I attended the LSA Annual Meeting in Boston as a graduate student. I have attended most of the LSA Annual Meetings since then. One thing I really like about the LSA Annual Meeting is how the poster sessions are handled: at some conferences they can be scheduled at odd times and places, but at the LSA Annual Meetings, the poster sessions are usually centrally located, in the middle of the day. This makes it so much easier to get worthwhile feedback! I also participated in a morphology workshop at the 2011 Institute in Boulder, which was my very first presentation to an academic audience, so the Summer Institute holds a special place in my memory. 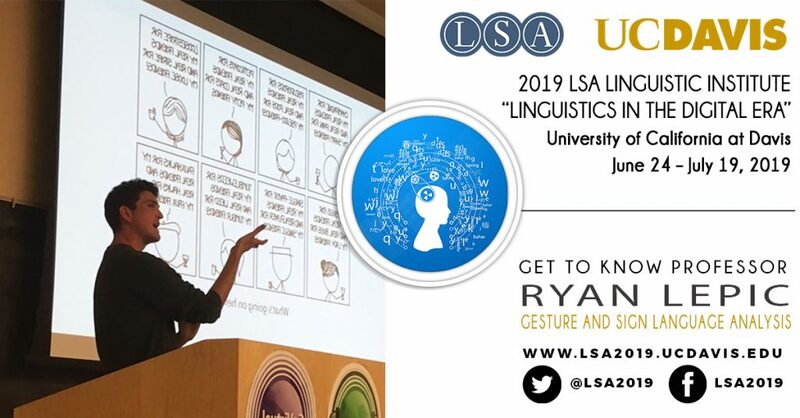 I taught “Sign Language Linguistics” at the 2017 Institute in Lexington, and I’m very much looking forward to teaching at the Institute again this summer. I’m co-teaching “Gesture and Sign Language Analysis” with my friend and collaborator, Corrine Occhino. Two of the main ideas motivating our course are that human languages are produced by human bodies, and that the majority of our language experience comes through face-to-face interaction. Looking at language in this way forces us to consider how the body can influence language structure, and what role phenomena such as eye contact, intonation, and co-speech gesture play in language processing and production. These topics are unavoidable in sign language analysis, and we will see that they are actually pretty essential for spoken language linguistics, too. The theme of the 2019 Institute is “Linguistics in the Digital Era”, and so we will also discuss digital methods in multimodal language analysis, including how to go about working with videotaped samples of language use on the internet. We are still deciding on the final content for this methods course, but we are very excited to work with students from any level of expertise or field of interest, and to guide all students in our class through hands-on analysis of sign language and co-speech gesture data. I’m finishing up a postdoctoral fellowship at the University of Chicago, a project funded by the National Science Foundation to better understand the role of co-speech gesture in learning. Our field is increasingly interdisciplinary, so it is very nice to have an opportunity to collaborate with psychologists, educators, and cognitive scientists to study the ways that people use speech, gesture, and sign to get things done. My ongoing linguistic research examines where new words come from, in signed and spoken languages. For example, “blending” is a creative source of new words in English, such as when “bro” and “romance” were combined to make the blend word “bromance”. Does a sign language like ASL have blends, too? My work shows that blending is widespread in ASL, and that blending even contributes to the emergence of new morphological patterns in ASL and in English. More recently, I have been looking at other word-creation phenomena in ASL to understand the role of gesture and iconicity in the development of new signs, and the emergence of productive word- and phrase-formation patterns in young languages. I really enjoy getting lost in a good science fiction series! Ann Leckie’s “Ancillary Justice” is very creative, and thought-provoking for linguists in particular. James Corey’s “Leviathan Wakes” creates a huge, detailed universe, and I’m impressed by the sci-fi nuances packed into each chapter. I’ve also been fortunate to live in some pretty diverse climates over the past 15 years, and I love taking long walks wherever I can, whether up a mountain, on the beach, or down tree-lined streets. One thing that I always feel grateful for in academia is that we get the opportunity to travel so much for our work, presenting and learning together at conferences around the world. So travel isn’t only a hobby, it’s a perk of the job! I’m embarrassed to admit that, even after living in California for almost a decade, I’ve never made it to Northern California! I’m looking forward to getting to know a university and city I haven’t yet had the chance to visit. For the Institute at Davis, I’m looking forward to meeting linguists from different backgrounds and interests, and working together to make linguistics an increasingly inclusive and practical discipline.